The Lancaster Business Improvement District (BID) have teamed up with Lancaster On Ice, to offer you the chance to earn a FREE pair of ice skating tickets, by shopping locally this festive season. For every £10 you spend in participating businesses (from Sunday – Thursday) you will receive a ‘Shop 2 Skate’ sticker. Once you’ve completed your flyer, and have obtained all 8 stickers, you can exchange the completed flyer for a FREE pair of ice skating tickets at the Lancaster On Ice Box Office in Dalton Square. There are 70+ businesses participating in Shop 2 Skate. They are easily identifiable by their A3 posters in shop windows, or you can visit the Lancaster BID website, to see a full list. Participating businesses range from high fashion retailers to florists and jewellers to art galleries and cafes to butchers- perfect for your Christmas shopping! Although Lancaster BID have nearly 800 tickets available, they are expecting them to be snapped up quickly by savvy shoppers, so make sure you take your completed flyer to the Box Office as soon as possible after completing it. Once tickets have run out, Lancaster On Ice will honour a 10% discount for anyone with a completed Shop 2 Skate flyer. 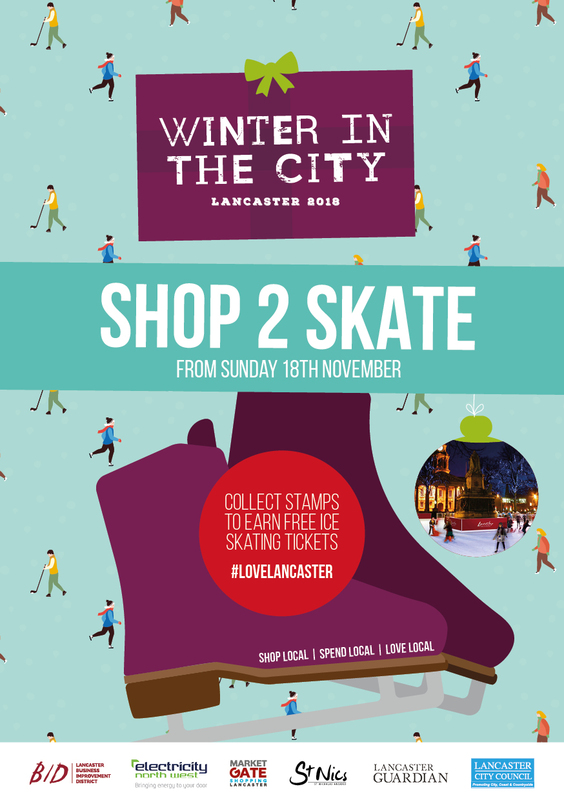 So make sure you shop local this Christmas and support the businesses of Lancaster, and you might as well earn some FREE ice skating tickets whilst you do! Participating businesses include: Arteria, Renes, The Hanging Basket, Uniform and Leisure, Incandescence Couture, Waterhouse Clothing, Elles Gallery, Cornerstone, Firths, Viva Interiors, Room 12, Dalton Square Florist, Gorrills, Mariyannas Boutique, Expressions of Lancaster, Casa Rastelli, Gregory Williams, Shoreway Fisheries, Marketgate Cobbler, Gillisons Bag Shop, The Market Cobbler, Inspire Gifts and Gallery, The Radish, Down to Earth, Cards and Candles, ALEX, Vincenzo’s, Banks Lyons Jewellers, Banks Lyons Shoes, Buccelli’s, The Vapour Corner, JOSEPH+CO, Simply Baby, Lancaster Escape Rooms, Fabrix, The Edge Cycleworks, Studio Arts, Your Health Store, Lancaster Bed Company, Nami Sushi, Filberts, Leonardinis, Lapel, Penny Street Collectables, Northern Yarn, Single Step, Roots Café, Esquires, Waterstones (King Street), Defying Dementia, Claire’s Accessories, Thorntons, Bowtique, Stable End Curios, The Cornish Bakery, Peter Charles Menswaer, The Bridal Collection, MJ Framing, Sharpes Coffee Company, The Sweet Emporium, Car Audios, Mason Brown, Dam Good Coffee, Look Fantastic, Accessorize, Specsavers, Silver Tree, The Music Spot, Lewis’s @ 23.